important factor, but they are wrong because biceps only make up 1/3 of the total upper arm muscle. The triceps make up the other 2/3 of upper arm muscle tissue. 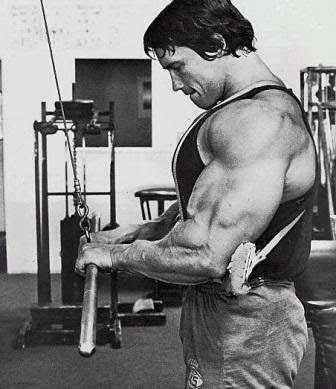 Want to increase Triceps Muscle mass? Do The above 5 exercises. Lift up onto the hands and bring the hips forward. Bend the elbows, keep the shoulders down and lower the hips down, keeping them very close to the chair. Push back up without locking the elbows. Start by raising one arm vertically overhead. Slowly bend your arm at the elbow and lower the dumbbell sideways behind your head. Squeeze your triceps hard at the top of the movement. Lie on a bench and hold a barbell in a narrow grip, hands about shoulder-width apart. Begin the movement by bending the elbows and lowering the bar towards the ribcage, elbows pulled in and close to the body. Concentrate on squeezing the triceps to push the weight back up. Avoid locking the elbows at the top of the movement. Start off by placing a cable pulley on the highest setting and adjust a stirrup handle to the pulley. Stand facing the weight stack and grasp the handle with and underhand grip. Keep your back straight, your abs drawn in and your knees slightly bent. Starting at the top push your arm down until it is straight, feeling the concentration and stretch in your triceps muscle.